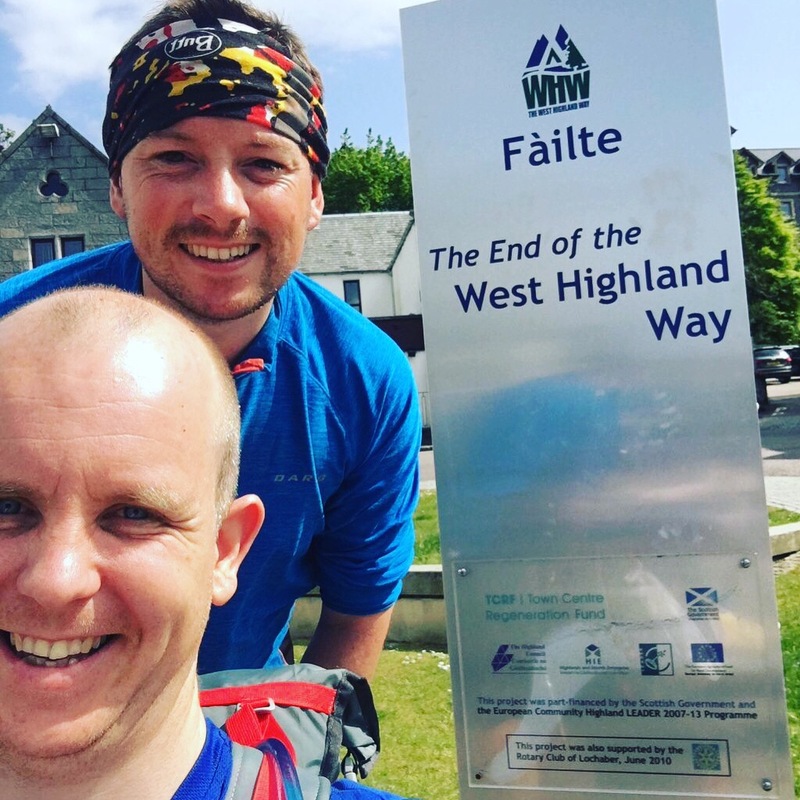 West Highland Way | Run Spud Run! The rain sounds like it is torrential lying in the tent even with my ear plugs in. We’ve been in this tent since 7pm when the rain started. It’s around 3am. These times when your bladder doesn’t really need to empty but because you’re thinking about it, you think you need to go. There was no way I was venturing out to the toilet at this campsite in this. It was forecast to stop at 9am. I’d have to wait. The broken sleep that continued that night had many thoughts of “giving up”. Heading back to civilised land. 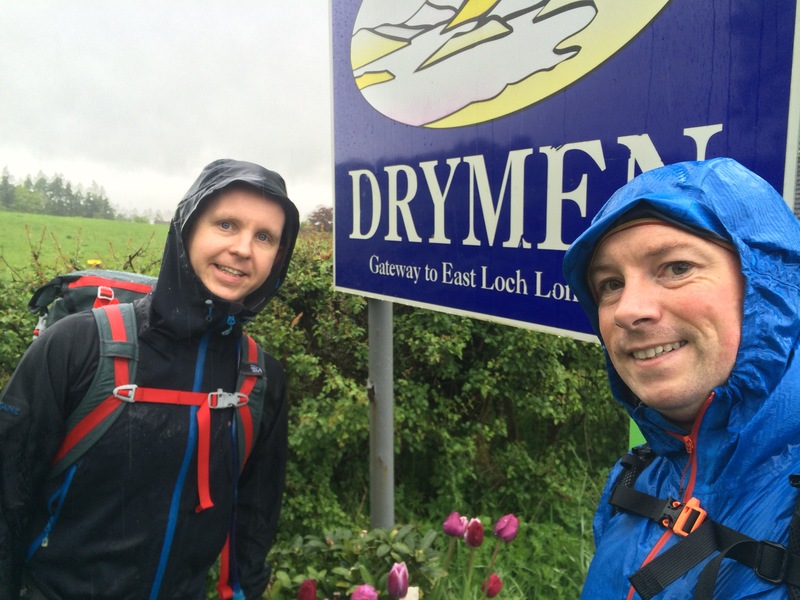 The West Highland Way – or just “The Way” would have to wait. Waking up, it was 7. The rain was still hammering down. The inside of the tent damp, the floor damp, mud was splashed up the outside of the inner. I was miserable, and hungry, and still needing to pee. The though of exiting the tent was horrifying me. The trainers I’d hidden under the outer sheet were soaked through. They were my “dry shoes”. My boots were on the other side, their fate unknown. Andy awoke too, this 2 man tent; more one and a half man meant any movement we both were awake. We lay there till 9 with thoughts of the first 2 days walking…. The first was damp, though we were clever to book a B&B after seeing the forecast and chickening out. They had a drying room, civilised. The walk was non de script really, a few ups and downs after Milngavie and a long stretch to Drymen via an old railway. Good enough to put your head down and continue walking, never missing much. I wasn’t wearing many layers and the light weight haglofs L.I.M. Jacket was soaked and the rain and wind made it feel cold. I thought the rain had seeped through and that my t shirt was wet, but it wasn’t thankfully. I must admit to feeling a bit miserable. The second day was good weather, enjoying the jaunt north of Drymen and going over Conic Hill with superb views of Loch Lomond. Reminding me of the John Muir Way. The sun was out in parts and it was warm enough for shorts and t shirt. 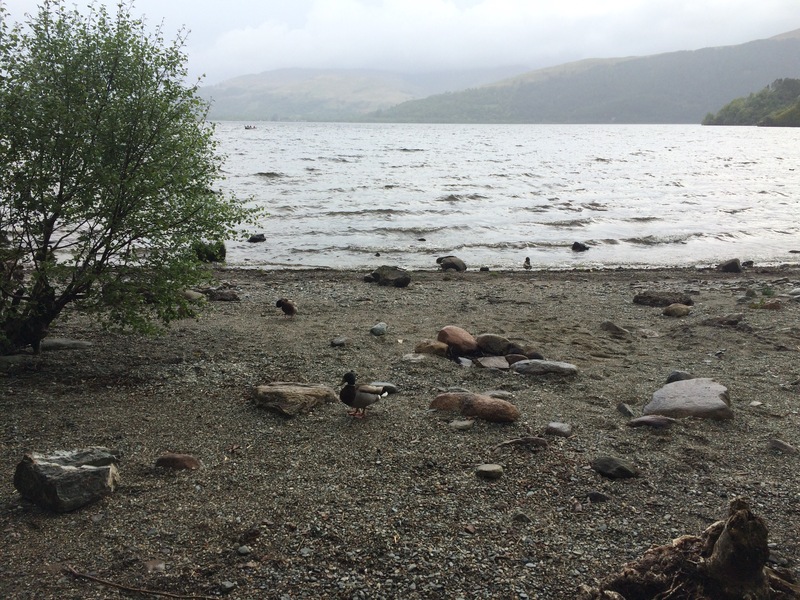 We continued along Loch Lomond after a spot to eat at Balmaha and arrived at Sallochy early. 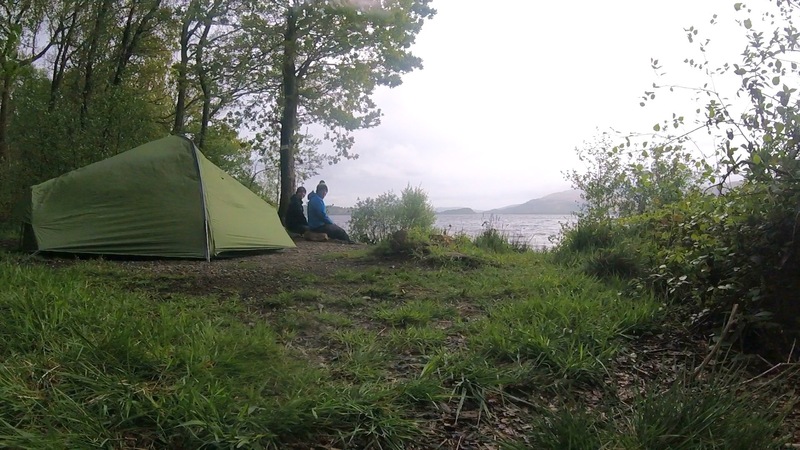 The rain wasn’t due until 7 and so we waited to get checked in by the warden, made a cuppa with the Jetboil and pitched tent by the loch in a fabulous picturesque spot. We ate a dehydrated meal of Pasta Carbonara and some Chocolate Mousse that filled a hole and waited for the rain to start. Right on cue the mist appeared in the distance and shrouded the other side of the loch. It was time to retreat to the dry tent. Little did we know what a night we were in for. And there we are, still lying in that damp tent wondering when we’d escape. Piling out of the tent in what felt like a break in the rain. I dashed to the loo, some comfort in this forestry commission campsite. I sat there contemplating the walk and how rubbish it will be in the rain. By the time I was heading back to the tent it was teaming down again, I hadn’t put my waterproof trousers on and I got soaked. It was cold. I was miserable and had lost my sense of humour. Andy forced me to eat the scrambled egg and potato dehydrated packet that we made in the shelter of the toilet block. It was rank. The coffee was better. But only just. We packed the tent up in a break in the rain doing our best to brush off all the mud and water. It was soaking, after all that rain the ground was saturated and we’d woken up in a puddle. It was time to set off, the rain was light with a forecast for dryer to come. It actually turned out to be sunny, and my misery faded. The walk North along Loch Lomond was pretty. The bluebells had been out throughout the walk but now with a back drop of waterfalls and loch it was prettier than ever. We took some water from an honesty box outside someone’s front drive and continued to walk stripping off our waterproofs along the way. We over took a German woman and some others that we were to see on and off throughout our trip. After Ptarmigan Lodge we took the high road avoiding the loch shore that was said to be tough going as this was our longest planned day at 27kms. The forest track that continued uphill, cool with many waterfalls looking impressive after last night’s rain. The path descended to Inversnaid where the Hotel served us burger and chips. We were only half way but at least we were dry and had full bellies! The second half of the 3rd day treat us to some fantastic paths up and down the loch shore, sometimes scrambling over boulders and along narrow and high paths. Trees would hang precariously to the edge as the path smoothed their exposed routes causing a trip hazard that would prove treacherous. The sense of danger added to the fun. The sun was a welcome sight, warming and drying my soul. Eventually the loch ends, Loch Lomond is larger than you think! The meadow that greets you is ideal for wild camping but we had a campsite planned with a pub so we continued on. The campsite was in the sun and we were glad to have arrived. Hungry and smelly we pitched our tent and let it dry out before unpacking the rest of our stuff. Thankfully the breeze was good enough to dry it out quickly. Beinglas Campsite benefits from a bar that serves food and a shop. We ate a large meal and enjoyed the beer that flowed after. Even though we were tired the bar kept us up and thirsty. 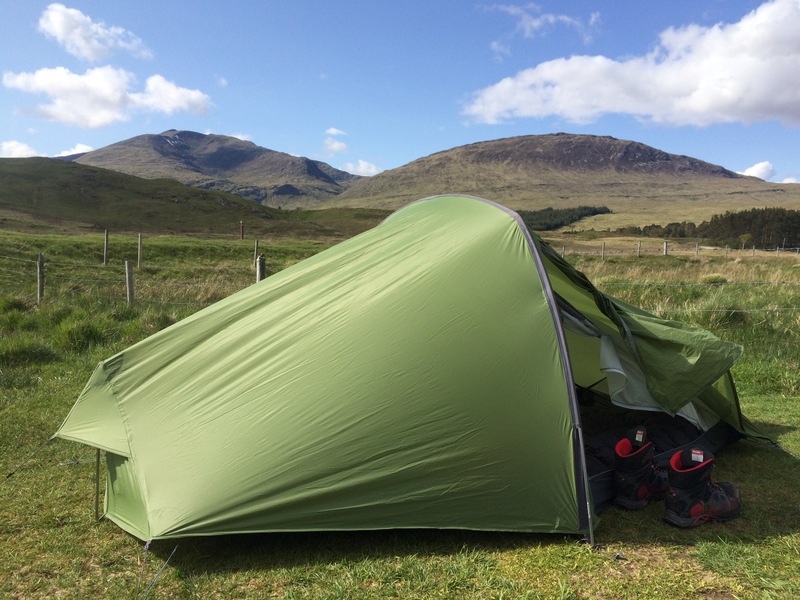 I slept well that night largely to do with the dryness, also the beer and mostly because of the Numo sleeping map from Alpkit! Day 4, we woke up and it was dry. We stocked up on food for the day at the shop and continued north. 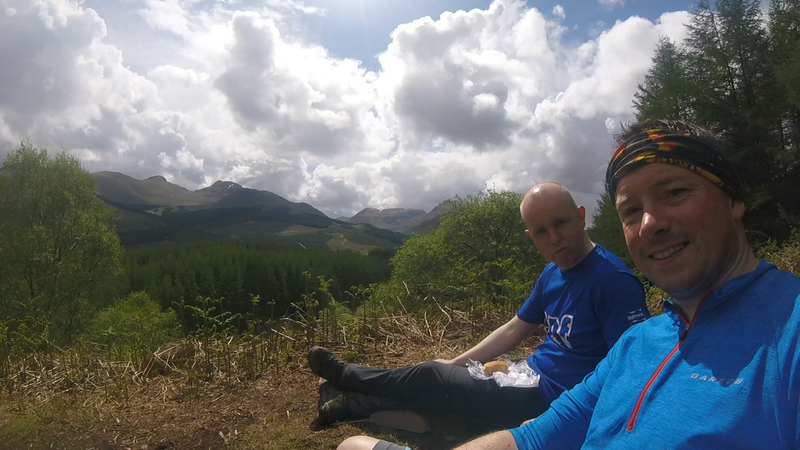 Our next stop was a short leg to Strathfillan between Crainlarich and Tyndrum. The path followed the river Falloch and the railway line and the main A82. The scenery was mainly of Glen and forest. The sun was strong which made the going good and spirits high. I was amazed by the railway line hugging the contour, half way up the hill with bridges connecting other hillsides. The clickety clack of the train echoing down the glen. We’d booked a wigwam for that night, en suite. Luxury. We checked in early and bought food for dinner, a BBQ and some wood for a fire. It was a sunny evening if a little cool. The shower in the en suite was nice and good to have a good clean and enjoy home comforts. 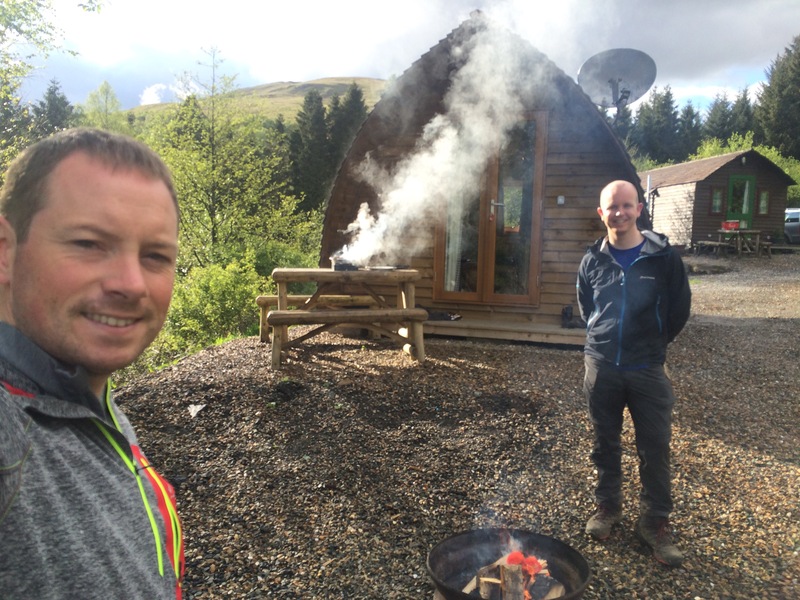 After a cosy sleep, the next day we ate bacon sarnies from the shop and continued our way to Tyndrum where we stocked up on food for 2 days. We planned to wild camp that night and the next day would be a long walk until civilisation. The climb out of Tyndrum was on good track again, following the old military roads up into the Glen. We were never far from road or railway. The sun was on our backs all the way and again we made good progress. We paused to eat some sandwiches on a stone bridge. A train clicked and rattled in the distance coming ever closer following the contours of the hill. Some highland cows were in the valley hanging out on the grass. We passed more walkers, very rare did we see any coming toward us. Our feet were getting sore on this unforgiving ground, the cobbles proving to be tough going on the soles of our feet, all the while the sun shone and the air was warm. Long gone were the thoughts of that wet morning. At Bridge of Orchy we stopped for a juice and some cake at the hotel and pressed on to our wild camp spot. 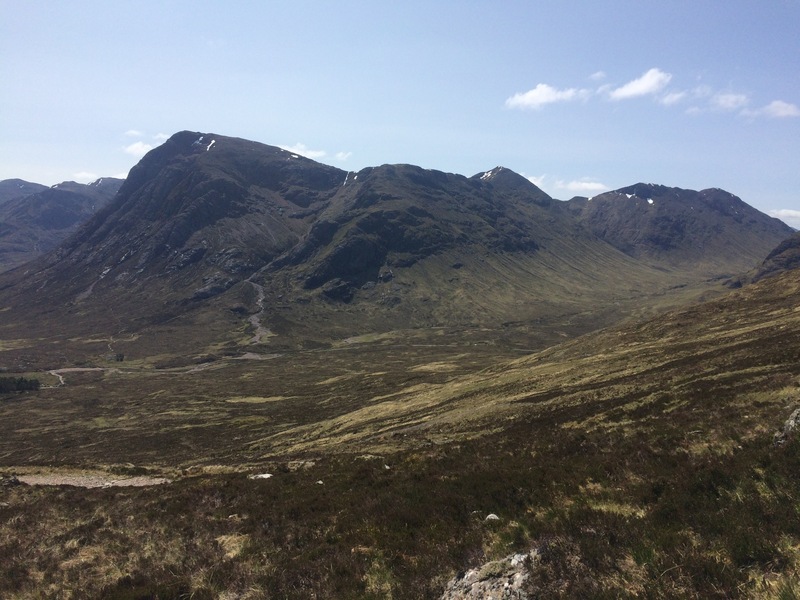 The scenery had gradually become more highland since leaving Benglas. The valleys became steeper, the hills more mountainous. The hill out of Bridge of Orchy took us through forest and high on a hill, as we rounded the corner a great vista of mountain appeared, snow capped with a loch in the Glen. We could see our wild camping spot, 200 yard down the road from Inveroran hotel. We stopped and took in the view before descending on soft ground to the road below. We pitched our tent on the north side of the road, a popular spot for stopping noting the local inn for refreshments. The setting could not be better, mountains on all three sides, river bubbling passed, trees and a bridge. We lay in the sun after pitching our tent. I went off to make sure the water source was sound. It was fast flowing and no sign of anything sinister. We decided to eat dinner early. It was 5:30. I collected water from the river and boiled it filling up our dehydrated pasta Bolognese. Our dessert was a melted galaxy chocolate bar that had thankfully reformed but the caramel had leaked. By now others who we’d met on the way began to arrive and pitch up so we left them to it and went for a pint. The inn has a walkers bar separate from the hotel really, entered through the back door. The beer was cool and refreshing drinking it outside in the last of the sun warming our backs. We stayed for a few until 10 when we decided we had probably had our fill and the craic between walkers in the bar started to dry up. Bidding our good night we left the bar and headed along the road. There was a herd of young deer that seemed undeterred that we were there and they continued grazing as we walked through them. The sky was purple above a distant mountain giving an awesome backdrop to our campsite. We climbed into the tent and closed our eyes and we were asleep in seconds. I awoke at 3am, needing to pee of course this time I was excited to leave the tent as it was dry and warm. I was in my boxers but pulled on a top for decency. The other campers were asleep and I was unsure where to go. I decided to walk along the road so that no one could hear me go. It was light enough to see without using a light and there was a certain peace at that time in the morning. I arrived back to the tent to find Andy also getting up. Those tennents beers went through the both of us it seemed. We awoke to a camper telling us that the pub was busy until 8 so there wasn’t any point in going until them. We held off on that advice being comfy in our tent. Again another dry morning. The breakfast from the hotel was basic but served a purpose. We filled our bottles with water from the designated outside tap and headed back to camp to pack up. It was sunny again with just a light breeze. I was feeling lucky that we’d made it since day 3 without getting wet. 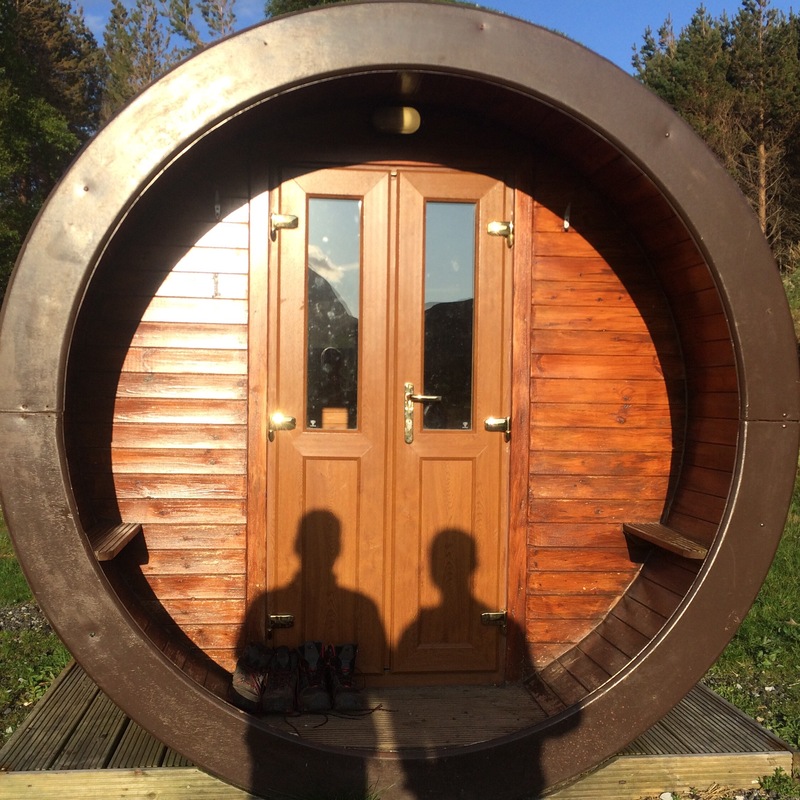 It was now day 6 and we were headed to Glencoe where a “hobbit hole” was booked. The path out of Inveroran was good again? An old drovers road lead up the side of the hill and across to other glens. The path was good going and busy, the views were of mountain and moor. Rannoch moor was off to our north and the mountains of Glencoe to our left. We were going well so decided to stop for a while. Each time we stopped folk we’d overtook passed us by. Faces became known and friendly, nods were exchanged and small talk was had. There were some folk who used a bag carrying service, others out on day trips and those like us carrying all our gear. We were fortunate to have lightweight gear all packed in 32 and 35 litre bags. Others weren’t fortunate and had huge 65 litre bags with lots of stuff. Glencoe came quickly and we detoured off the route to head to the ski centre. Our base for the night. It was 1:30 so we decided to chill and then take a tour up the ski mountain. The chair lift was strange to be on without snow or boards attached to our feet. Getting on and off was easier. The views from the top were amazing across Rannoch Moor and across to Beichaille Etive Môr. Snow was patchy on the higher slopes. The ski lifts looking abandoned with debris of old workings, fences and other machinery left strewn across the mountain. The accommodation was basically an insulated cylinder, with a door at the front and mattresses on either side. We slept in our sleeping bags and the night was comfy enough. I was excited about the walk on day 7 which would take us up over the Devils staircase. I couldn’t wait. We ate breakfast from the cafe when it opened at 9 after being woken up by a helicopter landing outside. 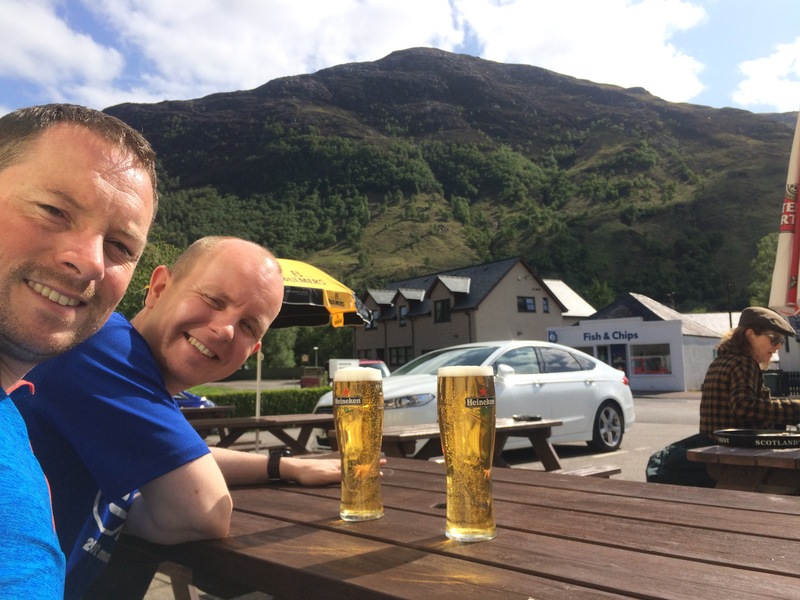 The day was to be 18km to Kinlochleven and there was to be sun all day. The highlands of Scotland looking awesome in this light. We headed toward Kingshouse following the road from the ski centre crossing the main road and onto a track. Beuchaille Etive Môr looking amazing on our left we were to skirt around this for half the day. At Kingshouse, a popular stop for campers there was a herd of deer again just chilling in the morning sun minding their own business as tourists took photos. The path here leads up the hill and back down to join the road at the start of the Devils staircase. This is a path that leads up over a hill and into the valley on the otherside to take you to kinlochleven. The path was steep in places. Warm with no breeze and I was sweating. I stopped often to take photos and relieve the feet and legs. We were half way. The breeze was back and cool and stayed with us for a while. We were making good progress although the downhill and unsteady ground was rubbing on my left ankle. I tied my laces without using the top hooks. This made little difference. I had to avoid my left ankle bending inwards which in turn avoided the boot rubbing the ankle. Maybe this is why it is important to break in new boots. I hobbled all the way down to kinlochleven. The road was awful, an access road for Rio Tinto Alcan vehicles and was made of large loose rock. Eventually we made it down the long road to the power station and the Blackwater Hostel where we’d booked a lodge. The sun was still shining and we sat outside taking the weight off our feet. I changed to my trainers. A welcome padded relief. This was the largest place we’d been to for a while on the route. It had two pubs and we sampled both but choosing to eat from the chippy and eating it back at the hostel on the picnic bench. The next day was to be our last on the way so we didn’t have too many beers, we were too tired to anyway. We started about 9 the next day and had breakfast from the pub. We were starting to sicken of having breakfast but we needed the fuel. The coop in the village provided us with our lunch for that day. My pack seemed lighter than usual as we started the ascent out of the village. At the top of the hill we entered a Glen and followed a wide gravel road. The path was busy with walkers, the sun shone too. We were making good progress , mentally is broken this last day into 3 sections of 8 Kms. By now we were travelling quickly. Part eager to finish and part just because it was easy going. We turned a corner at the 2hour mark and what was about 8 Kms and took shelter from the wind in a small culvert made by a stream. We ate a cliff bar here for energy and then powered on. The path took a route through what used to be forest. Hills can be seen in the distance. We started a climb though nothing serious and then suddenly into view came Ben Nevis. This view was to stay for most of the rest of the way, each step getting ever closer. We entered a forest and took rest where someone had recently wild camped and ate our lunch. The way had quietened down as the folk we’d overtaken must also Have stopped for lunch. Starting off again we were the only ones on the path and we wondered if we had gone the wrong way. The path was thin and winding its way through forest into a valley and then up again through a clearing. We joined a forest road, paved with loose stones and started to wind our way downhill all the time in the shadow of The Ben. My ankle was giving me massive hip so I decided to change to my trainers on this final leg. It was much easier and it made me want to run. Instead I hung back as Andys feet were “louping”. We hit the main road into town at Glen Nevis visitor centre and followed it until we reached the old finish. The new finish was some where in the town centre. We followed the signs. It took ages. We weren’t exactly sure where on the high street the finish was nor did we know where our hotel, the travelodge was. We eventually saw the sign for the hotel and right outside was the finish where a rubbish sign marked the end of the way. Some let down from the starting point at milngavie where you have a granite obelisk and a over head sign. It was good to finish, even better to be lying on a bed!